Tutor/Mentor Connection is a Chicago non-profit whose maps chart instances of issues like crime, violence and failing schools against the prevalence of student tutor/mentor programs. By showing this relationship, we want to create connections between at-risk students and business leaders, politicians, educators and citizens who are willing to help. I've worked on, and featured these maps on this Mapping For Justice blog for the past three years. 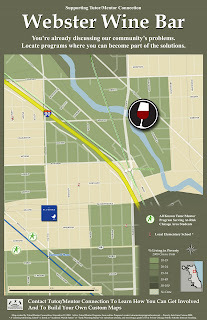 The main gallery event – with $5 wine specials and complementary appetizers – is this Wednesday, November 17 (“GIS Day”) from 6pm till 10pm at Webster Wine Bar (1480 W Webster, Chicago). 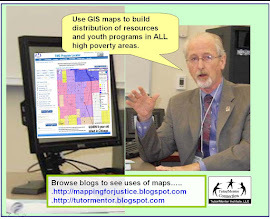 Join us to see for yourself how Tutor/Mentor Connection is Mapping Solutions... to the issues that concern all of us! If this is a cause/technology that you feel is important, please consider a tax-deductible donation to this event. We have made a lot of progress with our mapping over the past two years thanks to a $50k donation in late 2007, and also thanks to your continued generosity toward our various fundraisers. As a non-profit, however, it is an ongoing struggle even in the best of times to continue investing in new technologies , toward the organizational goals, and toward continued momentum. With the state of the current economy, charitable contributions are at a 20-year low, and more than ever, we're in jeopardy of losing that momentum we've created. But enough heaviness. Let's drink some wine!